1. Preheat the oven to 220C. Almond peel, then place on a baking sheet and roast in the oven for a few minutes. Watch out for them, not burned, but only flushed. Then grind the almonds in a blender or in a mortar. Using tweezers, carefully remove all bones from fish. Garlic peel and finely chop. Artichokes ebsuite from the marinade and slice. 2. Cut the crust from ciabatta, crumb grind in a blender. Remove the lemon zest. Put in a bowl the almonds, ciabatta, garlic, artichokes, mint and zest. Add 3 tablespoons of olive oil, squeeze a little lemon juice, season with salt and pepper, mix well. 3. Both pieces of fish with salt. Cover a baking sheet with parchment and cover with one piece fillet skin side down, pre-paving underneath the string (as pictured). Then put the filling and cover with second piece of fish. Cover with bacon and thyme sprigs, hard tie with twine. If you still have stuffing, optionally, you can sprinkle the fish on top. 4. Bake in the oven at 220C for about 30 minutes. If you cook fish portions, it should last 15 minutes. 5. Before serving, cut the twine and drizzle the fish with lemon juice. 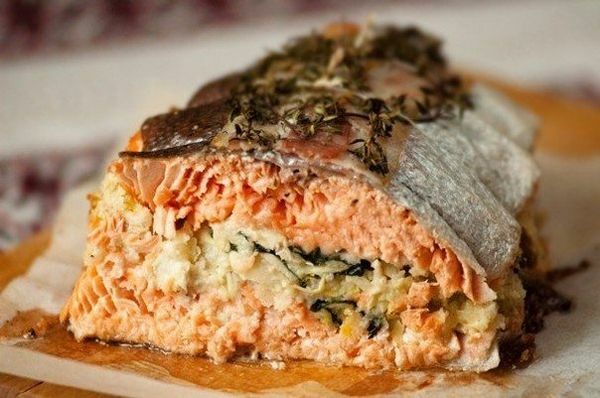 You can serve it with a green salad or boiled potatoes.